Have a potential buyer? – A Sewer Line Video Inspection in Seattle or any location around the puget sound is a compliment to a home inspection. Knowing the condition of a sewer line can be a big influence on purchasing a home. If an unknown broken pipe or root intrusion is present it can have expensive consequences to the new owner. Spending a little money now can save big down the road. Here at Emerald City Sewer Inspection we have the camera equipment that will accurately see the condition of the side sewer. 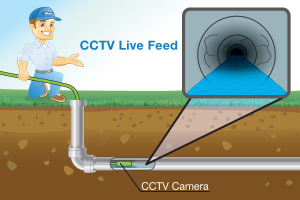 Whether its Clay, Concrete, Abs, Pvc, Cast Iron, Galvanized, or Poly pipe the camera has a clear image of the condition during a sewer inspection. What some homeowners don’t realize is that they are responsible for any problems in their sewer system from the house all the way to the main sewer connection. But knowing the condition before the offer is reviewed can give opportunity for a mutual agreement to split the cost of the sewer repair (if any) or suggest the seller pay for it before closing. Real estate agents always get our special discount on sewer line video inspections for just $235 and CC payments of just $245. We do not charge for removing a toilet, going on a roof, or locating one area. We are very prompt and usually show up 10 min early to every scheduled appointment. Another aspect of our sewer inspections in seattle or anywhere else is we can pinpoint the problem area if there is one. We have a locating wand that will target the problem area and we will mark the area and document the issue. Saving the buyer and seller time and money when it comes to a repair. This aids the repair technician, saving them lots of time as well. Contact. Give us a text or call and set up an appointment. We do a Seattle sewer line video inspection 7 days a week and serve all of the Puget Sound area! Great service, on time and very knowledgeable. Showed up early and very friendly! Anthony was very knowledgeable and professional, very personable as well I would definitely recommend them for any future sewer scoping that you need!!! Thanks!!! Anthony at Emerald City Sewer Inspections is always on time and charges an hones rate. He'll take the time with clients to review the video live, in person, which is something that most inspectors do not; other inspectors I've worked with perform the scope as quickly as possible, give a basic report, post the video online without speaking to the client. Five star rating! Anthony is very professional and knowledgeable, he came right out and made sure that I understood all aspects of my sewer line. He arrived early and walked me through the whole process, I learned so much! I highly recommend Anthony with emerald city sewer inspection to anyone! Text or Call Today and Save!